Early in the morning and late in the evening is when shorebirds escape disturbance on the beaches on which their survival depends. This is the ninth article in our Contested Spaces series. These pieces look at the conflicting uses, expectations and norms that people bring to public spaces, the clashes that result and how we can resolve these. There’s no doubt about it, Australians love the beach. And why not? Being outdoors makes us happy, and all beaches are public places in Australia. Head to a beach like Bondi on Christmas Day and you’ll share that space with more than 40,000 people. But we aren’t just jostling with each other for coveted beach space. Scuttling, waddling, hopping or flying away from beachgoers all around Australia are crabs, shorebirds, baby turtles, crocodiles, fairy penguins and even dingoes. Beaches are home to an incredible array of animals, and sharing this busy space with people is critical to their survival. But, if we find it hard to share our beaches with each other, how can we possibly find space for nature on our beaches? Here’s a classic example of how hard it is to share our beaches with nature. Head to a busy beach at dawn, before the crowds arrive, and you will most likely see a number of small birds darting about. You may recognise them from the short movie Piper – they are shorebirds. As the day progresses, swimmers, kite surfers, dog walkers, horse riders, 4x4s and children descend upon the beach en masse, unwittingly disturbing the shorebirds. 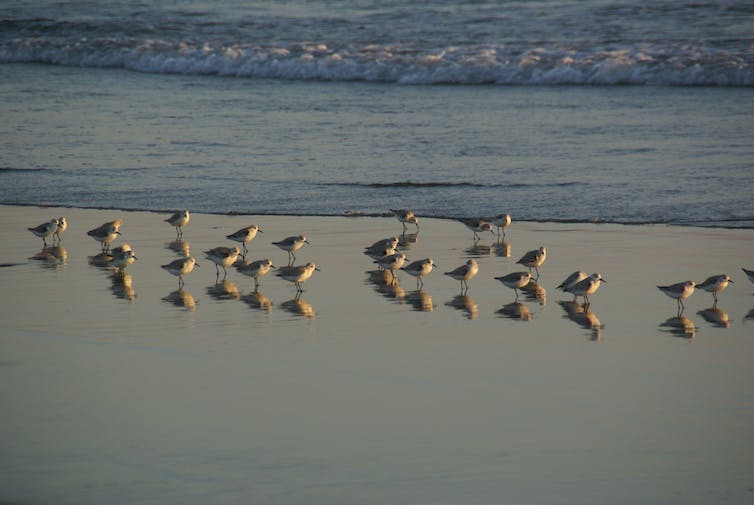 We share beaches with an extraordinary array of life, including many shorebirds. Unlike seabirds, shorebirds do not spend their life at sea. Instead, they specialise on the beach: foraging for their invertebrate prey, avoiding waves, or resting. However, shorebird numbers in Australia are declining very rapidly. 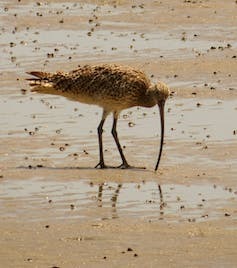 Several species are officially listed as nationally threatened, such as the critically endangered Eastern Curlew. There are few places you can let your dog run for as long and as far as it pleases, which is one of the reasons beaches appeal to dog owners. But this disturbance results in heavy costs to the birds as they expend energy taking flight and cannot return to favourable feeding areas. Repeated disturbance can cause temporary or permanent abandonment of suitable habitat. 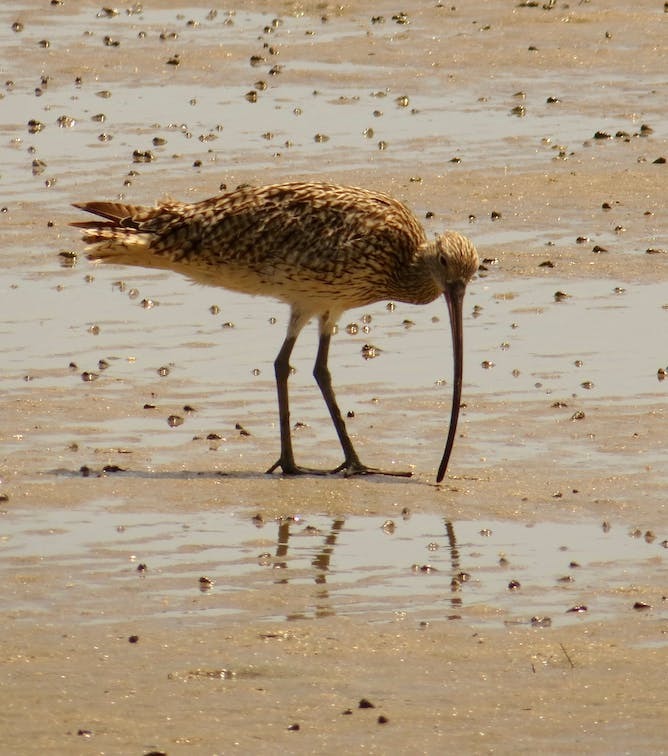 The world’s largest shorebirds, Eastern Curlews are critically endangered – and Australia is home to about 75% of them over summer. The fascinating thing about many of these shorebirds is that they are migratory. Beachgoers in Korea, China, Indonesia or New Zealand could observe the same individual bird that we have seen in Australia. Yet these journeys come at a cost. Shorebirds must undertake gruelling flights of up to 16,000 kilometres twice a year to get from their breeding grounds in Siberia and Alaska to their feeding grounds in Australia and New Zealand. In their pursuit of an endless summer, they arrive in Australia severely weakened by their travels. They must almost double their body weight before they can migrate again. And these birds must contend with significant daily disruption on their feeding grounds. A recent study in Queensland found an average of 174 people and 72 dogs were present at any one time on the foreshore of Moreton Bay, along Brisbane’s coastline. And 84% of dogs were off the leash – an off-leash dog was sighted every 700 metres – in potential contravention of regulations on dog control. One conservation approach is to set up nature reserves. This involves trying to keep people out of large areas of the coastal zone to provide a home for nature. Yet this rarely works in practice on beaches, where there are so many overlapping jurisdictions (for example, councils often don’t control the lower areas of the intertidal zone) that protection is rarely joined up. 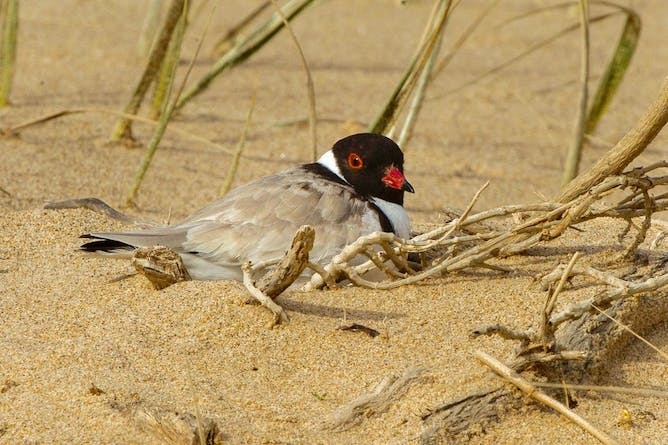 The beach-nesting Hooded Plover is unique to Australia where it is listed as vulnerable (and critically endangered in NSW). However, our work at the University of Queensland shows we don’t need conservation reserves in which people are kept out. Quite the reverse. We should be much bolder in opening up areas that are specifically designated as dog off-leash zones, in places where demand for recreation is high. 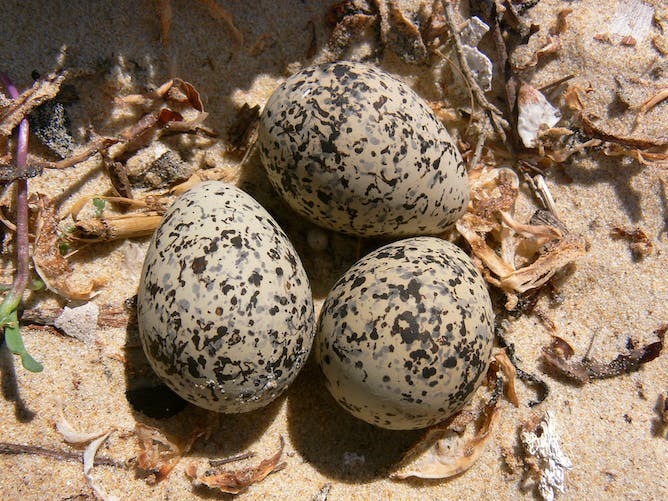 In the case of Moreton Bay, 97% of foraging migratory shorebirds could be protected from disturbance simply by designating five areas as off-leash recreation zones. Currently, dogs must be kept under close control throughout the intertidal areas of Moreton Bay. By zoning our beaches carefully, the science tells us that the most intense recreational activities can be located away from critical areas for nature. And there’s no reason why this logic couldn’t be extended to creating peaceful zones for beach users who prefer a quiet day out. By approaching the problem scientifically, we can meet recreational demand as well as protect nature. Proper enforcement of the boundaries between zones is needed. Such enforcement is effective when carried out in the right places at the right time. We believe that keeping people and their dogs off beaches to protect nature is neither desirable nor effective. It sends totally the wrong message – successful conservation is about living alongside nature, not separating ourselves from it. Conservationists and recreationists should be natural allies, both working to safeguard our beautiful coasts. The key is to find ways that people and nature can co-exist on beaches. You can find other pieces published in the series here.